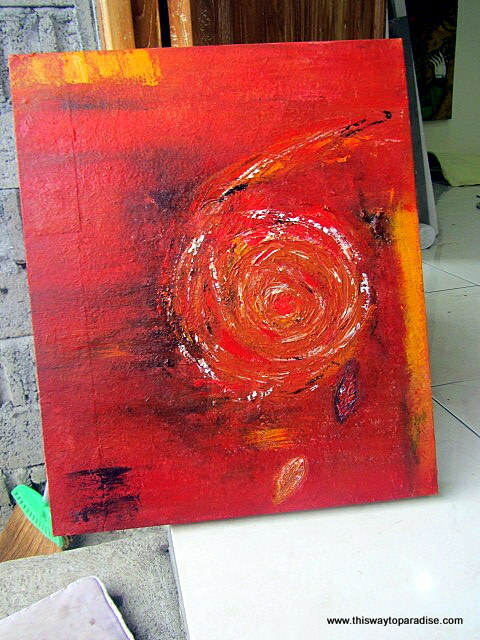 Ubud, Bali is home to many artists and painters. I knew before I arrived that one of the things I wanted to learn while I was here was how to paint. I wasn’t sure, though, how to go about finding someone to teach me. As I was wandering the streets of Ubud one afternoon, some guys who were sitting on the sidewalk asked where I was going. I decided to ask them if they knew where I could take a painting class. They laughed, both moved in opposite directions to reveal a sign that said, “Open Painting Class-Have Fun Time With Balinese Artist.” I knew, immediately, that I was meant to take this class. Nyoman Suarsa picked me up from his art gallery downtown and took me to his village studio and home. I loved getting to see Balinese life. His mom was making the offerings. His children played. 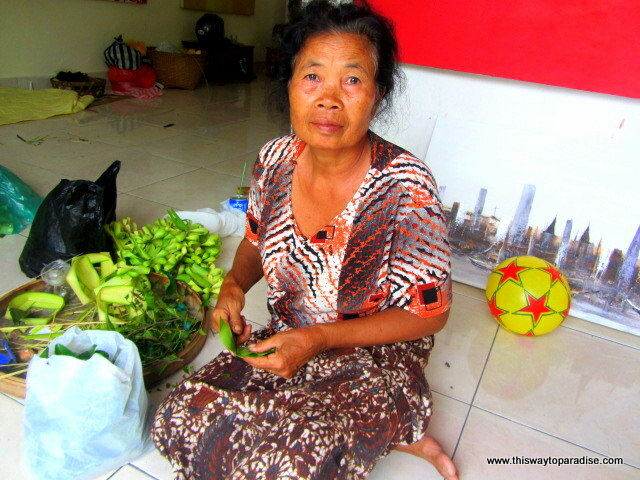 The family sold offerings and mangosteen on the side of the street, and my painting lesson began. What I didn’t realize is that not only was I about to learn how to paint, I was also going to be getting a lesson in following my dreams. Nyoman Suarsa had to work hard to follow his dreams, and his story humbled me, as I learned it. He grew up very poor in a village with no electricity. He started drawing when he was ten years old, and his first drawing was on his bedroom wall in the dark. He had no pencil, as his family couldn’t afford one. So, he started drawing in the dirt. When he was twelve years old, his father wanted him to join him to work in the rice fields. Nyoman heard a voice telling him that this wasn’t the right path for him, and he left home. Can you even imagine leaving home at twelve years old to follow your dream? He went to Ubud because he knew that was where all the famous artists lived. He stayed with Wayan Sadia, a famous Ubud painter and earned his food and shelter by cleaning Wayan’s house. 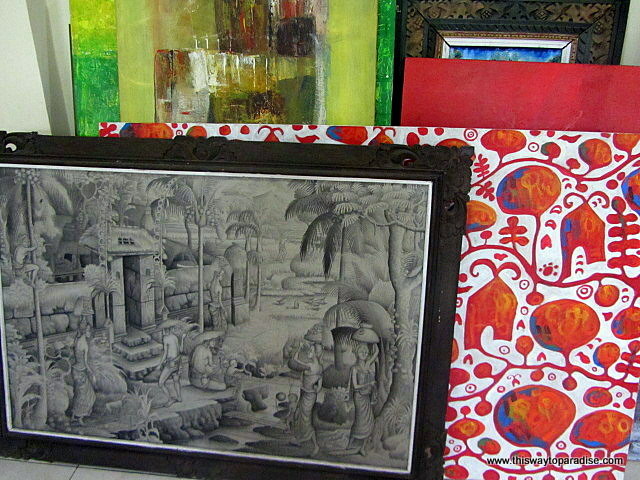 Wayan was a traditional Balinese painter who painted in black and white with Chinese ink. He watched him paint, and one day, he started to paint as well. Wayan thought that Nyoman’s paintings were very good, and started teaching Nyoman more about painting. 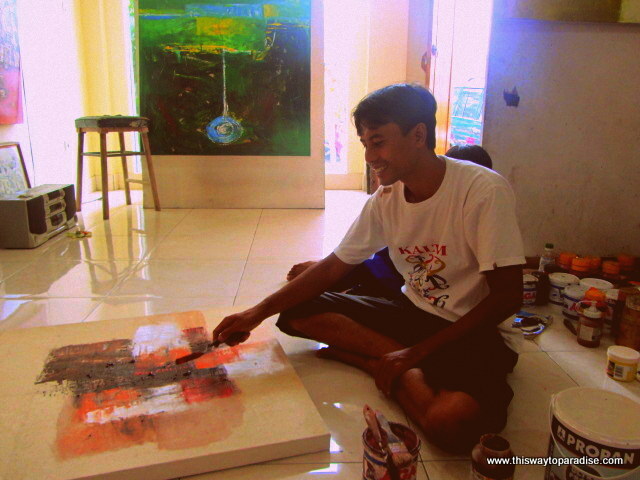 When he was just 13, Nyoman sold his first painting at the Ubud gallery. He started selling two paintings every month. When he was 21, he started painting with color and in abstract form. I was so touched that he had worked so hard to make his dream a reality. I had such a great time in my lesson with Nyoman. He told me to clear my mind, and just feel what was there, and let it come out on the canvas. He showed me some of the techniques that he uses to create texture. It was very clear to me that Nyoman’s work comes from a deep spiritual place inside of him. I asked him, “How does one go about following one’s dream?” His answer? “Be honest with yourself, and then make it happen.” My new motto? If Nyoman can, I can. This was my first time painting, and I was amazed at how everything just flowed through me onto the canvas. I felt my emotions in the colors I chose, and painted the energy that I was feeling. Nyoman said that I did a very good job, and that he could even sell what I did in a gallery. If you would like to learn to paint, you can reach him at 081 23647875 or email him at [email protected] The marketer in me also created a brochure for him, and encouraged him to start putting it around town in the restaurants and hotels. I will also be creating a Facebook page for him in the next few days, so that more people can be blessed by this humble artist who is living his dream. Do you have a dream that you want to be following? Leave a comment and tell me what it is. Let the dreamer in you come out! You may also enjoy my Bali Escape Guide! Thank you, Alejandra!! Let’s get together soon…I will be hanging out at Alchemy for lunch on the 11th after a session at Yoga Healing Bali or ?? I have found my calling, and it feels great!! How much does he typically charge for teaching? Talon, he charged me 350,000 rp or around $35 for a two-hour class. This included pick-up and drop-off to his studio and all materials. I believe he will give a discount for groups! My friend and fellow blogger Karen McCann picked up painting when she moved to Seville. Such a beautiful place, it’s a wonder the place isn’t overrun with painters and classes! Sounds like a lovely way to get local. Yes, I love that I first learned here, and now want to make sure that I take a painting class wherever I travel! I can’t wait to pick up different techniques from different artists! I like the idea of taking a class to immerse yourself in a local culture. My outlet for creativity is in the kitchen, and I took a cooking class while in Ubud. It, too, was held in someone’s home. I loved learning about the ingredients and flavors–and through that about life in Bali. I love that idea, Larissa!! I hadn’t thought of a name yet, so that’s perfect. I also love to cook, so maybe I should take a cooking class next! What a cool thing to do while traveling. I wouldn’t have thought of this. i love this – and his paintings are so incredibly beautiful! YAY – and love YOUR painting, too! This looks like a lot of fun. I’m artistically challenged but it’s something I’d like to improve upon. That looks like a dreamy activity in a dreamy location! I love that Nyoman was so compelled to draw as a child he made lines in the dirt because he didn’t have a pencil. I also love his zen approach to art. It seems an ideal way to teach visitors from other lands and cultures. Neat travel — and blog — idea. Your first painting is AWESOME! Unbelievable!! What a lovely idea, and how nice for you to have created brochures for him, FB page, not to mention this blog posting! Will try to check him out when I am there as well! Cheers! P.s. How did you get that big canvas HOME? Thanks, Candy….I rolled it up! ← How To Travel: What Kind Of Traveler Are You?